Tried this recipe when I had to finish off the last portion of my sprouted black eyed peas. I blamed myself for not noticing her blog till now. I might have seen it here & there, but never noticed that she has such a huge collection of recipes. Impressed by her! I have made some minor changes in the recipe to suit our taste buds. I must admit that, this is a non-tiring & nutritious recipe. Thank you Nupur. Pressure cook the peas with a big pinch of salt for 2 whistles. Let the cooker cool for 5-10mins. Meantime, make a fine paste of the coconut, green chillies & rice. Keep aside. Add a cup of water to the chopped spinach & cook them on medium heat for 3-5mins (Spinach gets cooked fast). Add the cooked peas, tamarind paste, salt, jaggery & the ground paste to it. Boil on a medium heat for 5-7mins (Let the peas & spinach absorb the spices). Finally prepare the tempering. Heat a small pan. Add oil to it. When oil is hot, add mustard seeds. When seeds splutter, add curry leaves & finely chopped onions.Saute till the onions become translucent. Finally add the asafoetida & turn off the heat. Pour the tempering over the curry prepared & mix well. Serve hot with plain or mildly flavored rice. We preferred it with plain rice. Original recipe had garlic, that I have avoided. If your family prefers garlic, you could use it too. Back to the festive spread. 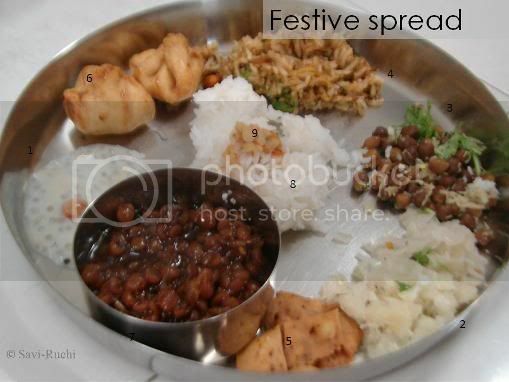 Thought of sharing with you my Ganesha festival thali or spread. We had a great festival this year. My son thoroughly enjoyed the prayers & the food. 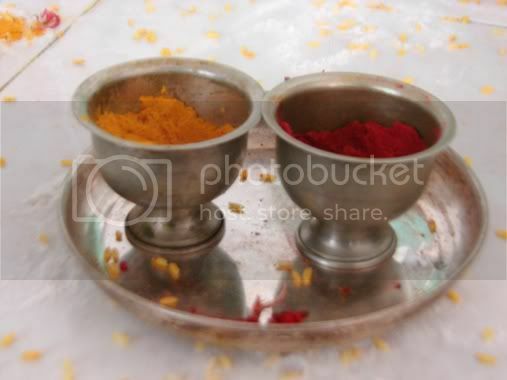 Poor guy was forced to fast with us, as I was busy preparing the prasadam(offerings to God). Here is what I prepared. Here is a picture for you (It has items 1-9). I was too tired & hungry after preparing. Hence, did not make effort to take pictures in different angles. Did not even bother to place them in different bowls. Will take better pictures next time. Promise! Some of my cousins started cooking after they moved out for work. One such cousin requested me to share very simple & nutritious recipes for him to try out. He is very close to me since my & his childhood days. I specially prepared this dish for him, took step-by-step pictures so that it helps. This one is for you Ashwin. He was the inspiration behind me to start this new series. This is also for those who have just entered the kitchen & do not have much knowledge about cooking. I will try to post a recipe at least once in fort-night for this series. 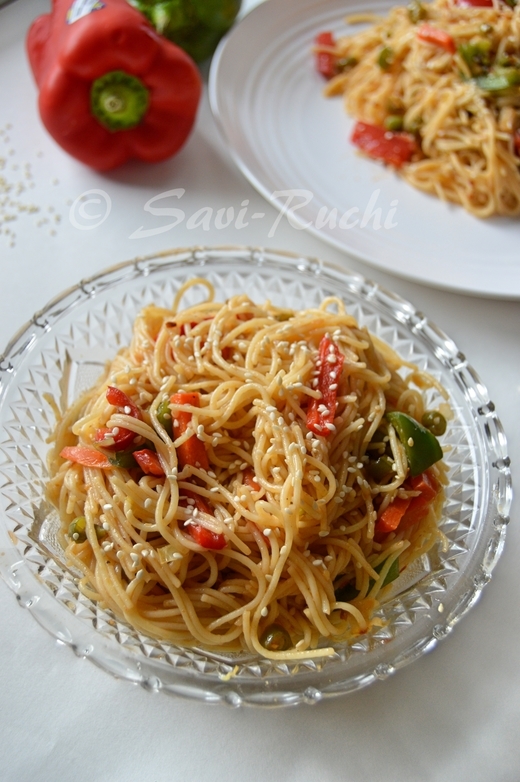 This dish tastes great when mixed with hot rice & a dollop of ghee. Tastes good with Indian breads (chapathi). Could be eaten as is. Wash the carrots & gently peel the outer skin. Grate the carrots & keep them aside. Heat oil in a broad pan, when oil is hot. Add mustard seeds, when mustard seeds splutter, add urad & gram dal. When dal turns golden brown, add red chillies & curry leaves. When leaves turn crisp, add the grated carrots & saute for 10-15secs. Add the water & allow the carrots to cook on a medium flame for 5 mins. When carrot is soft, add salt, sugar & cook again on a low heat for a minute. Turn off the flame & finally garnish it with coriander leaves & grated coconut. Serve it hot with steamed rice or chapathi or roti.